If you’re a person who enjoys going to the cinema, you probably also have certain things you like to do while there to maximise your experience and enjoyment. Perhaps you’ll buy some popcorn and a drink, or some nachos or ice cream even. Maybe you’ll get there early so you can bag your favourite spot and enjoy the trailer, or fill up an entire row with all your mates. Mostly, these things aim to heighten your experience and fulfil your cinema-going desires. Some people, on the other hand, are a bit stricter when it comes to watching films. Especially when it comes to watching one of the most hyped films ever. 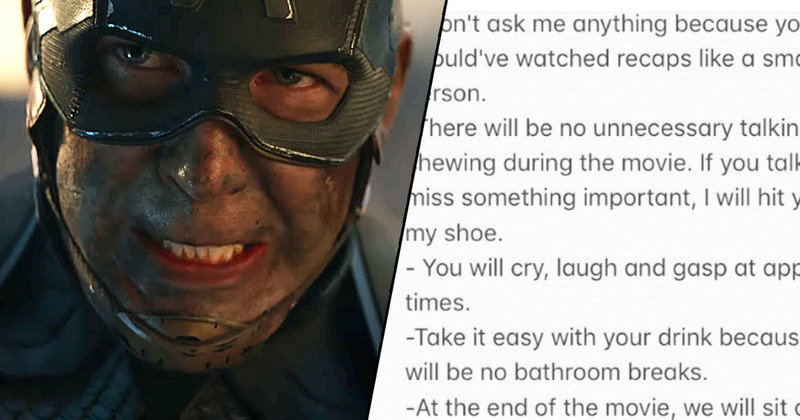 In a bid to maximise their own, unique experience while watching the upcoming Avengers: Endgame, one person has shared a very particular set of rules for their friends to abide by if they watch the film together. Though it must be said, finding a friend to go with you after laying down these rules may be easier said than done. Which is probably a good thing for the rule-maker – just go on your own and keep your rules to yourself? Thankfully, it does read like the rule-maker is being (at least slightly) tongue-in-cheek about it. I’m sure they’re not going to make you piss yourself if you’re sitting next to them and need the toilet. But yeah, no talking during the movie please.